This park honors Major John W. Mark, who lost his life fighting for the U.S. Army in World War I (1914-1918). Mark, a member of the 302nd Engineers, served throughout Europe at Soissons, Chateau Thierry, and Vesle. Now the largest and most densely populated community in central Queens, the area derives its name from the Jameco (“beaver”) Native Americans, who lived along the shores of what is now Jamaica Bay. In 1655, the first English settlers arrived in Jamaica from Massachusetts and eastern Long Island. Within a year, they secured a land grant from the Dutch Governor Peter Stuyvesant (1610-1672), who had named the area Rustdorp (“rest-town”). Rustdorp soon became the seat of Queens County. By the end of the 17th century, the English renamed the town Jamaica, and it included all lands south of the present location of the Grand Central and Jackie Robinson Parkways. During the Revolutionary War (1776-1783), the area was predominantly Tory (opponents of American independence) and occupied by British Troops. In 1814, Jamaica became the first village in Queens County incorporated as part of the United States of America. In 1837, John Ackland conveyed this land to the Village of Jamaica for park purposes. A map prepared in 1868 by the trustees of Jamaica seemed to confirm this transaction. By 1912, the borough of Queens laid out the site as a park, but the chief engineer in the borough noted that it was unclear whether the land belonged to the City. 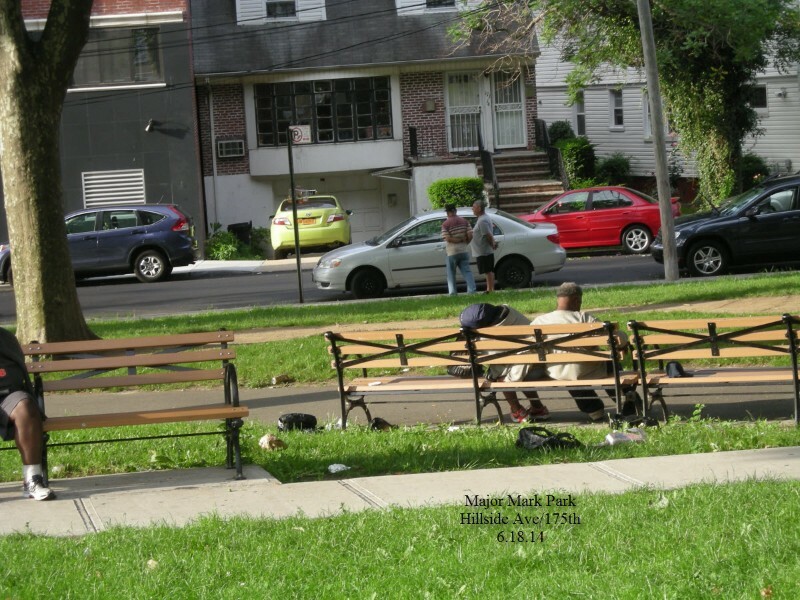 In 1914, the Hillside Civic Association asked Queens Parks to clean up the poorly maintained site, but since it was never assigned to Parks it did not fall under Parks jurisdiction. In 1915 the Queens Borough President made a request to the Board of Estimate that the property be assigned to Parks, at which point a debate ensued when heirs to Ackland’s estate claimed title to the property. The debate was settled in court, and in 1920 the Board of Estimate assigned the property to Parks, and the 1912 plan was carried out by the Queens Borough President’s office. In 1933, this crescent-shaped lot located at Hillside Avenue between 173rd and 175th streets was named for John W. Mark. Including four grass plots divided by walkways that meet in a central formal plaza with an ornamental flagpole, the park also features two pieces of outdoor sculpture. In 1960 the Soldiers and Sailors Monument (1896) by Frederick Wellington Ruckstuhl was moved to the site from a spot farther down Hillside Avenue at Merrick Boulevard. 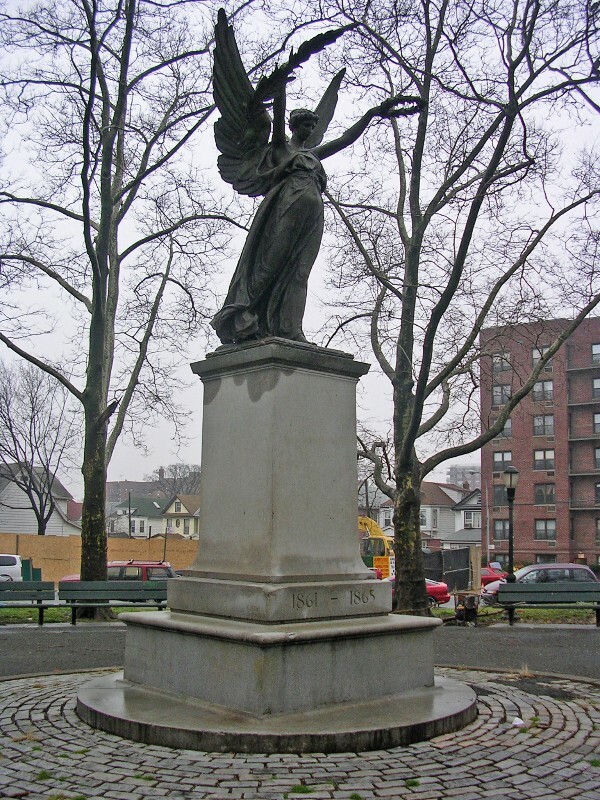 The angel holding a wreath and palm bough commemorates Union Army soldiers and sailors from Queens who died during the Civil War. An abstract piece by Roger Balomey, Untitled #1 (1973), is also featured at the park.